It’s kinda old now, but you still find it used in situations where the equipment isn’t updated very often (old control systems, CCTV, old point of sale systems etc). 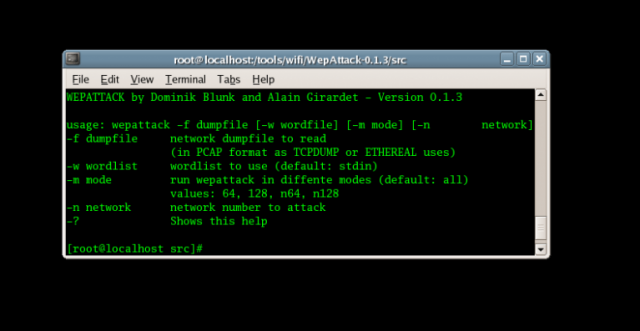 WepAttack needs a dumpfile for attacking networks. 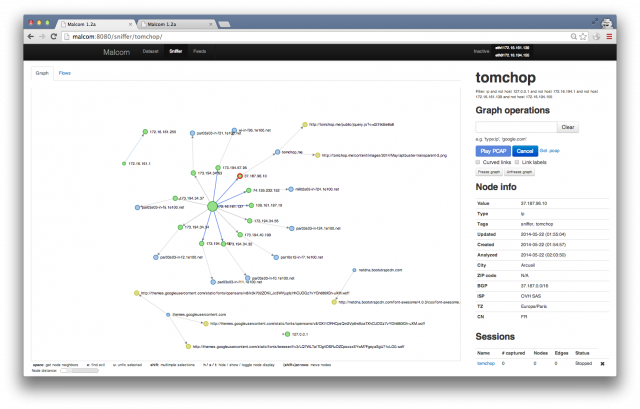 If the network data is captured by Kismet a dumpfile is generated automatically. This file is in format “Kismet-[date]-[no].dump“ and can be passed to WepAttack. Secure drive erasure methods are supported out of the box. Erases files, folders and their previously deleted counterparts. Works with an extremely customizable scheduler. Why a Secure Erase Hard Drive Wiper is important? A lot of people underestimate the importance of this, especially if you are throwing out an old hard disk or selling something on that contains a hard disk (an old laptop or desktop). Your first thought may be that when you ‘delete’ the file, the data is gone. But that is not true, when you delete a file, the operating system does not really remove the file from the disk; it only removes the reference of the file from the file system table. The file remains on the disk until another file is created over it, and even after that, it might be possible to recover data by studying the magnetic fields on the disk platter surface. That is why it’s critical to erase your disks properly before finding them a new home (be that a bin, recycling plant or selling them on). Depending on the value of the date, select one of the below secure wipe algorithms. British HMG IS5 (Baseline), 1 Pass, Your data is overwritten with zeroes. British HMG IS5 (Enhanced), 3 Passes, British HMG IS5 (Enhanced) is a three pass overwriting algorithm: first pass – with zeroes, second pass – with ones and the last pass with random data. SQL Injection has been the most critical web application vulnerability in the last decade according to the OWASP Top 10 list of most critical web application security flaws (yeah come-on guys, we are still waiting for the new version!). Though the Netsparker statistics show us that it is the other way round, at least in terms of volume. 26% of the identified vulnerabilities, 40,908 to be exact, were a mix of reflected and DOM Cross-site scripting (XSS) vulnerabilities. Only 2% of the identified vulnerabilities were SQL Injections. Update your apps, your server, your software – Apple, Google, Microsoft are constantly harping on this topic but it doesn’t seem to help that much. It’s one of the easiest best practices to follow, especially in modern times with automated updates and patch management software easily available. It seems not to be the case that people are following it with 5% of the identified issues related to outdated software. If Equifax and Mossack Fonseca had their software up to date, last year we wouldn’t have had two of the biggest data breaches on the internet. 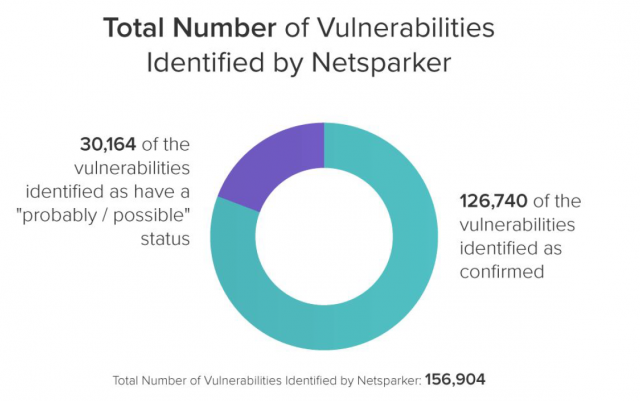 There are several other statistics from which we can learn something from, an interesting one for me was the fact that Netsparker automatically verified around 80% of the identified vulnerabilities. False positives are a big problem in automated vulnerability and security scanning as someone has to manually spend hours verifying the results and weeding out the false positives. With Netsparker automatically doing this, a smaller team can do more effective work and a larger team can be more productive doing less manual verification. 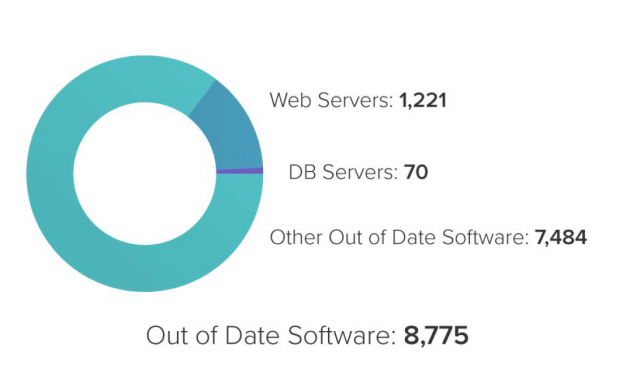 The report is much more detailed and has much more statistics, so please read the Netsparker scan statistics report for all the numbers and common security issues that make web applications vulnerable to malicious hacker attacks and can save you from some embarrassment.